On the site today, we get to know Sametime, a dynamic duo of brothers from Queensland’s sunny Sunshine Coast. 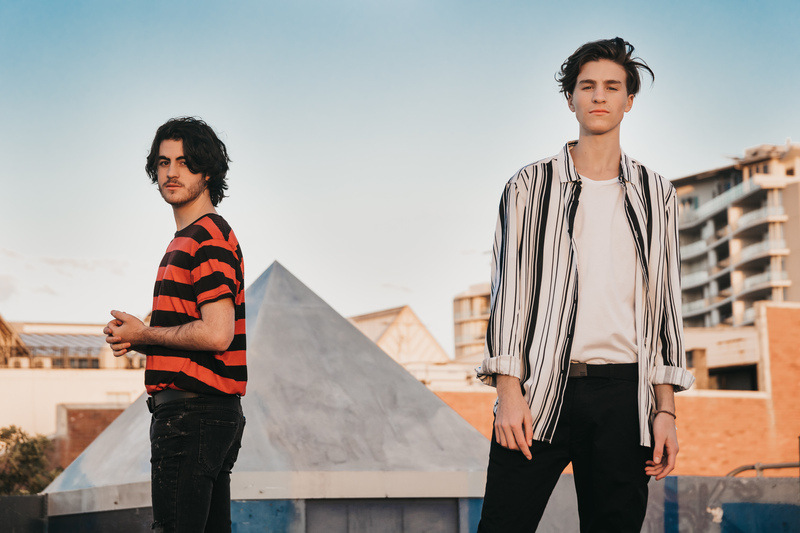 They’ve already been kicking some serious career goals, explain below how they came up with their band name and have recently dropped their latest single ‘When You Come Down’, which we think is a pretty solid thing. But who are they? What makes them tick? Scratch the surface and get to know Sametime below. 01. Band name : SAMETIME. 02. How did you choose your band name? TIM – After months of going back and forth with a few different ones we were getting pretty frustrated…. Then one day in the car on the way home from a recording session we started yelling out different names. Someone said ‘Sametime’. SAM – Easy… it’s just SAM and TIM with the letter E on the end. 03. Where are you based? SAM – We come from the Sunshine Coast in Queensland. 04. Who are your members? TIM – Sametime is just Sam and I but when we play live we have three other great mates that join us on stage. 05. And what role do they play in the band? SAM – Tim plays guitar/ keys and I play a stand up Drum Kit. We both sing. TIM – The sibling harmonies is kind of our thing. 06. How was the band formed? SAM – We are brothers and are only a couple of years apart. We always had music around the house and started busking when we were pretty young…. TIM – I was 12 and Sam was only nine when we started performing. 07. Tell us a little bit about your sound. TIM – Its changed heaps over the last seven years but now I would say that the sound is sort of indie pop. But other genres creep in from time to time. 08. If you had to compare yourselves to an already established act sound-wise, who would it be? SAM – We’ve been compared to artists like Ball Park Music and Jake Bugg. 09. Give us five words to best describe the band. Young (16 – 19), Hardworking, Fun, Driven, Open-Minded (figured if we put the hyphen in it was one word). 10. In what ways has the band changed from when it was formed to today? TIM – When we started it was only ever just Sam and I playing. We would busk around the Sunny Coast at markets and school fetes with a guitar and a cajon. Now when we perform we play as a five piece band. SAM – of course when we started out we also only played covers. We’d learn a few new ones each week then go out and see how they would go. Now, 90% of all of the songs we play at our gigs are originals. 11. What are your members’ favourite songs of all time? TIM – Tough one. SAM – We’re teenagers!! Favourite songs of all time last a couple of weeks… ha! 12. What’s your band’s biggest claim to fame so far? TIM – Well it’s a toss-up between being the youngest band to play at Bluesfest or among the youngest ever to be signed to Sony ATV. SAM – Yeah… both happened when I was still only 14 years old! 13. If you could score the support slot for any act, who would you choose? TIM – I’d probably say Arctic Monkeys. SAM – I’d have to go for Ed. Who wouldn’t want to play a stadium? 14. What’s been your strangest experience as a band? TIM – We made the biggest mistake ever when we were supporting Shannon Noll. I did the whole “who’s ready for Nollsy?” line. SAM – Yeah… then we had to wait for about five minutes for the crowd to stop the Nollsy chant…! 15. Tell us about your latest release. TIM – I wrote ‘When You Come Down’ one night after seeing social media posts about some blokes having fun at a music festival. They were commenting on photos about girls they knew pretending to be someone other than themselves. It’s a made-up story. 16. What do your plans for global superstardom involve? SAM – We are just going to be working hard for as long as it takes to get there. We know there’s plenty to do so we are just going to keep doing it until something happens. TIM – We’ve got lots of great industry partners now who all seem pretty happy with how things are tracking so we will keep writing and performing and releasing until we get our break. SAM – Just got to write a hit. 17. Where can our audience catch you live? TIM – We post on all the usual suspects so you’ll always find us if you follow us. September 29 we are playing at Caloundra Music Festival and some supports in Brisbane during October. SAM – We are also launching our EP at Sol Bar here on the Sunny Coast on November 02.